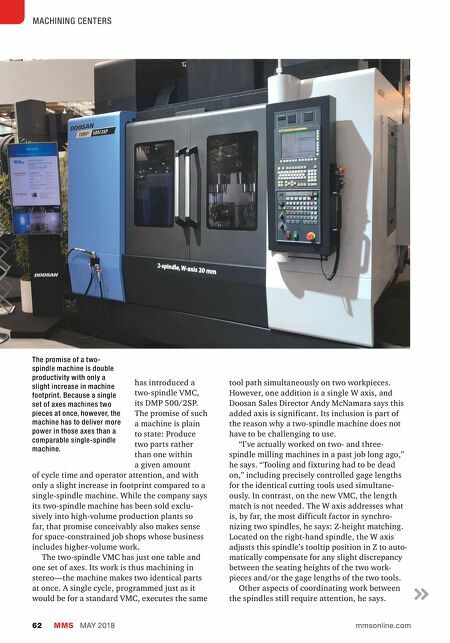 MMS MAY 2018 62 mmsonline.com MACHINING CENTERS has introduced a two-spindle VMC, its DMP 500/2SP. The promise of such a machine is plain to state: Produce two parts rather than one within a given amount of cycle time and operator attention, and with only a slight increase in footprint compared to a single-spindle machine. 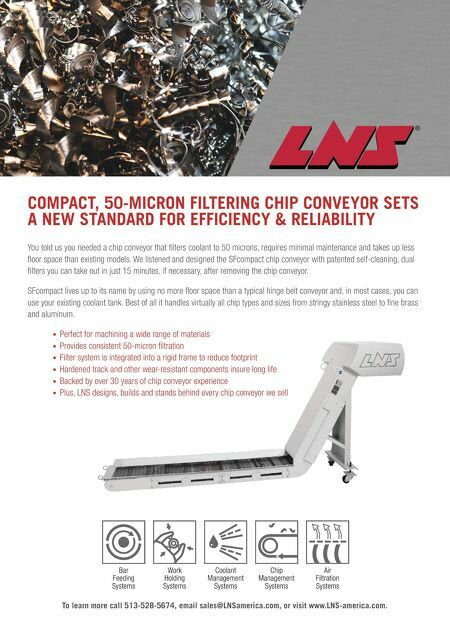 While the company says its two-spindle machine has been sold exclu- sively into high-volume production plants so far, that promise conceivably also makes sense for space-constrained job shops whose business includes higher-volume work. The two-spindle VMC has just one table and one set of axes. Its work is thus machining in stereo—the machine makes two identical parts at once. A single cycle, programmed just as it would be for a standard VMC, executes the same tool path simultaneously on two workpieces. However, one addition is a single W axis, and Doosan Sales Director Andy McNamara says this added axis is significant. Its inclusion is part of the reason why a two-spindle machine does not have to be challenging to use. "I've actually worked on two- and three- spindle milling machines in a past job long ago," he says. "Tooling and fixturing had to be dead on," including precisely controlled gage lengths for the identical cutting tools used simultane- ously. In contrast, on the new VMC, the length match is not needed. The W axis addresses what is, by far, the most difficult factor in synchro- nizing two spindles, he says: Z-height matching. Located on the right-hand spindle, the W axis adjusts this spindle's tooltip position in Z to auto- matically compensate for any slight discrepancy between the seating heights of the two work- pieces and/or the gage lengths of the two tools. Other aspects of coordinating work between the spindles still require attention, he says. The promise of a two- spindle machine is double productivity with only a slight increase in machine footprint. Because a single set of axes machines two pieces at once, however, the machine has to deliver more power in those axes than a comparable single-spindle machine.